If you want to buy cheap australia shirt for 2018-19 season, buy it here in cheap-football.com , Check our exclusive range of australia Football Shirts / Soccer Jerseys and Kits for adults and children at amazing prices. 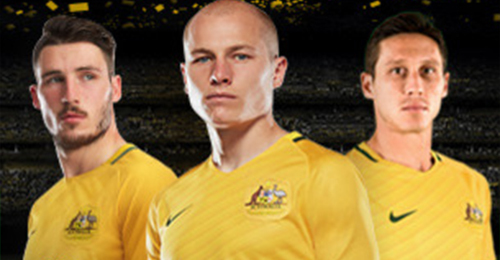 Get the cheap australia jersey shirts, soccer kits with wholesale price, Free Shipping Worldwide! Australian national soccer team represents Australia in international men's soccer.Australia has participated in five World Cups: in 1974 and 2006, both held in Germany, 2010 in South Africa and 2014 in Brazil and recently achieved its classification to the Russian World Cup 2018.Australia is the only national team to have been a champion of two confederations, having won the OFC Nations Cup four times between 1980 and 2004, as well as the AFC Asian Cup at the 2015 event on home soil. The team has represented Australia at the FIFA World Cup tournament on five occasions, in 1974 and from 2006 to 2018. The team has also represented Australia at the FIFA Confederations Cup four times.